Sickle cell anemia is an inherited blood disorder that affects red blood cells. 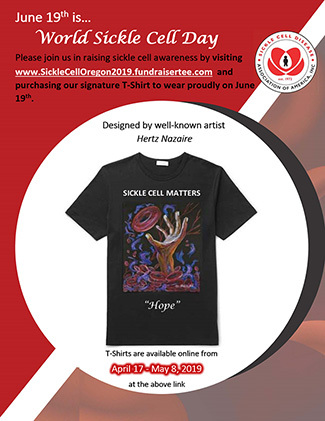 People with sickle cell disease have red blood cells that contain mostly hemoglobin* S, an abnormal type of hemoglobin. Sometimes these red blood cells become sickle-shaped (crescent shaped) and have difficulty passing through small blood vessels. Normal red blood cell Sickle-shaped red blood cell. When sickle-shaped cells block small blood vessels, less blood can reach that part of the body. Tissue that does not receive a normal blood flow eventually becomes damaged. This is what causes the complications of sickle cell disease. There is currently no universal cure for sickle cell disease. There are several types of sickle cell disease. The most common are: Sickle Cell Anemia (SS), Sickle-Hemoglobin C Disease (SC), Sickle Beta-Plus Thalassemia, and Sickle Beta-Zero Thalassemia.